I’m a night person – that’s the most basic inspiration. I wrote most of my dissertation at night, for example. Back when I was in graduate school, I remember teaching The Sabbath by Abraham Joshua Heschel: in this work he argues that observing the Sabbath creates a “cathedral in time” and that Judaism can be understood as a tradition based on sacred time rather than on sacred space (the latter so familiar to us from Christianity and Islam) – Heschel’s work made me think of time, and especially everyday time, as a category of analysis for historians. Then, when I was researching my dissertation on death and funeral rituals in early modern Germany, I discovered the strange rise of honourable nocturnal burial among Lutherans around 1660. Prior to this time, Christians had always considered nocturnal burial extremely dishonourable, reserved for criminals, heretics, and the like. Why the rise of lavish, Baroque funeral services and processions by night? Trying to answer this question led me into nocturnalization, an early modern revolution in European culture and everyday life. What were the greatest challenges you faced in writing Evening’s Empire? Finding the logical and practical scope for the study presented a huge challenge. The night is endless, but the book had to have an end! Also, by the time I completed the writing process in 2009-10 I’d been at it for about a decade (!) and I’d built up a lot of pressure on myself. That was also challenging. How does Evening’s Empire fit with your wider academic interests and research? Evening’s Empire brings a cultural history of darkness together with a history of the night in everyday life. I see the history of daily life as a powerful but overlooked approach to history, and I use analyses based in the quotidian in my other research projects. Also, in the last chapters of Evening’s Empire I examine Europeans’ “enlightened” attitudes toward Asians, Africans, and Americans. I suggest that nocturnalization transformed some of the fear of “creatures of darkness” such as ghosts, witches, and demons into a sense of superiority over “dark” people, “dark” places, and “benighted” cultures outside of Europe. This aspect of European attitudes toward other peoples in the age of the Atlantic slave trade is the focus of my new research. Anywhere I can: generally at my office in Gregory Hall on the University of Illinois campus. Big parts of the book were written in a carrel at the Newberry Library in Chicago – a superb place to work! Laptop or desktop all the way. On this topic, I was inspired by ‘Cultures of Darkness: Night Travels in the Histories of Transgression’ by Bryan Palmer (Monthly Review Press, 2000). Roger Ekirch’s ‘At Day’s Close: Night in Times Past‘ (W. W. Norton & Company, 2006) is packed with information. Probably a Hardy Boys mystery. Yes, a study of European attitudes toward other peoples in the age of the Atlantic slave trade. Subject to change at any time! 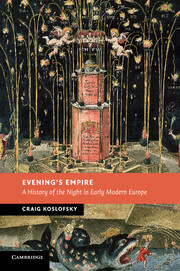 Craig Koslofsky is author of ‘Evening’s Empire’ (out now), and winner of the Longman-History Today Book Of The Year award. He is Associate Professor in the Department of History at the University of Illinois, Urbana-Champaign.